Before I introduce this berries and cream smoothie, I want to talk a little bit about why I love smoothies. There’s something about the endless number of combinations that makes them so exciting to me. I’ve highlighted their amazing benefits and what to consider when making them in posts here and here. I’ve also written about the differences between juices and smoothies, and their respective benefits here. 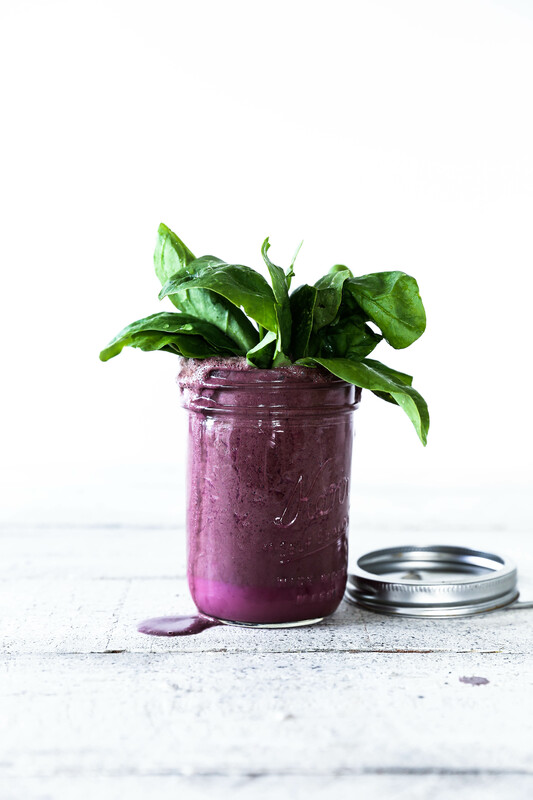 So in this post I’m going to talk about the potential sugar content of smoothies and juices, which is a subject that’s not always that obvious, and can be quite confusing. So what determines the sugar content in a juice or smoothie? There are two main factors: 1. Whether you’re dealing with a juice or smoothie, and 2. How much fruit it contains. So lets take a look at the the juice versus smoothie factor first. A juice is essentially made from whole fruit and vegetables that are pressed through a juicer. The juicer extracts all the liquid nutrients and in the process removes all the fibre. Fibre is what naturally slows down the absorption of any sugars present, so by removing it you’re effectively creating a very easily absorbed juice. This is great if it’s full of nutrients, but not so great if it’s full of fructose which is the main sugar in fruit. Unlike glucose, the body doesn’t produce fructose nor does it use it for energy. Instead fructose is sent to the liver which is the only organ that can metabolise it. If you have a diet with excess amounts of fructose the liver can get overloaded and will start turning fructose into fat, which of course we want to avoid. Smoothies on the other hand, are a blended mixture of fruit and vegetables, often with added protein powders or seeds and a liquid to keep things moving. They naturally retain all the fibre present in the fruit and vegetables meaning any sugars present are absorbed into the body much more slowly. When making a juice, try and limit the fruit content to one piece of low fructose fruit such as a green kiwifruit, green apple or berries, and make the other piece a lemon or lime which are naturally very low in fructose. If you’re feeling brave try using no fruit at all and just a lemon or lime. If you get the recipe right, you’ll be amazed at just how good a juice can taste like this! I’ve posted one of my favourite sugar free, green juice recipes for your reference here. If you’re making a smoothie, reducing fruit content isn’t such an issue because all the fibre is still present. But if you’re keeping an eye on your sugar intake then it’s still a good idea to make them majority vegetable based with just one or two pieces of fruit. Just to be crystal clear, I’m not saying don’t eat fruit. Fruit is an amazing source of fibre, vitamins, minerals, phytonutrients, and live enzymes that help the digestive process. The key is to make sure you’re eating the whole fruit so that you get all these benefits. If you’re buying smoothies or juices that comes packaged with labels, always check for hidden sugars. The most commonly used are fruit juice concentrate, reconstituted fruit juice, pineapple concentrate, apple juice and grape juice. All these have been refined down to concentrated fructose and contain very little nutrients so are best avoided. After writing all these points I realised my Inspired Smoothies e-book needed updating to include more low fructose options. So I’ve created a third, low fructose edition. All 12 recipes contain only 1 piece of low fructose fruit such as green apple, kiwi fruit or berries, or no fruit at all. 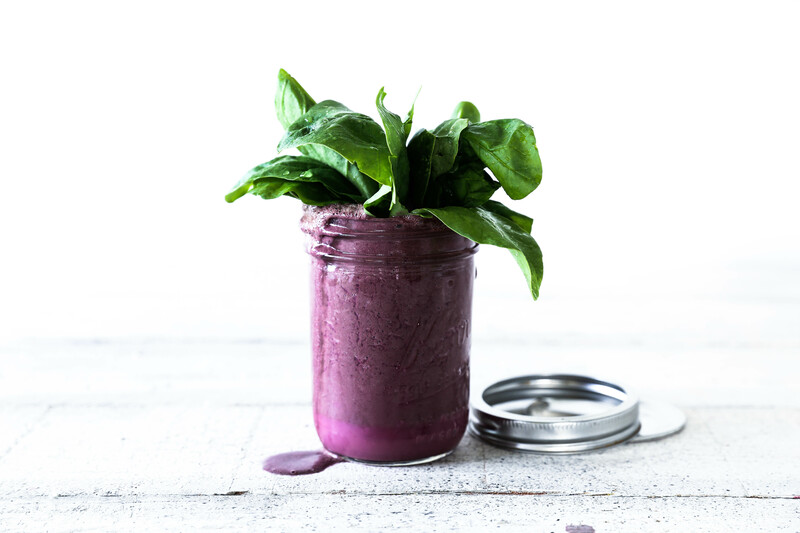 You’ll be amazed by how a little clever ingredient combining can create some delicious smoothies, juices and tonics, that are naturally sweet and very low in sugars. 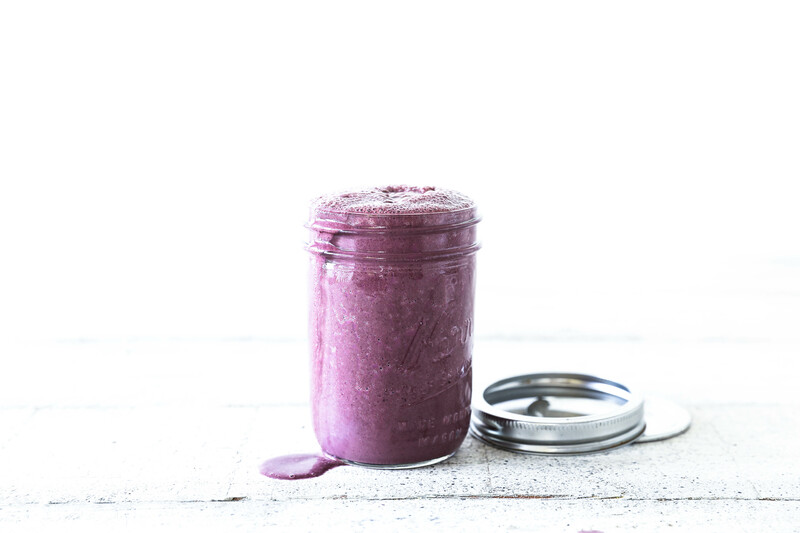 The recipe below is a preview of one of the prettiest coloured smoothies from the e-book, called berries and cream. It tastes exactly as it sounds, lots of creamy coconut mixed with sweet berries. It has a magical violet colour and best of all it also has hidden stash of greens that you’d never guess were there! Place all the ingredients into a high speed blender and blend on high speed until well combined and smooth. Pour into a serving glass and serve immediately. Alternatively, this smoothie can be stored in a sealed glass bottle in the fridge for up to 2 days.